Description: Dinosaurs once lived in Canada, and we have the fossils to prove it. Digs across the country have turned up fascinating finds. Each fossil discovered tells us more about the creatures that used to live here. Some of the amazing dinosaur fossils found in Canada include: Anchiasaurus, Tyrannosaurus Rex, Troodon and Triceratops. Jake's Review: Loved the pictures in this book, they looked sort of real without being super scary. The book was quick and easy to read and I got it done while waiting for mom to burn cook dinner. I thought the book was probably written for younger kids since I found it easy to read. 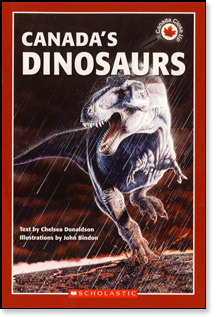 I learned a lot about Dinosaurs and for a non-fiction book it was actually fun to read. I would be willing to read more like this, especially if they use the word poop like in this one. Mom's Review: Really good introduction to Dinosaurs that lived in Canada for kids in the 6 to 8 range. It is written in the perfect language for this age range, simply, but at the same time introducing them to the odd more challenging word. There are nice bits of humour thrown in to keep the kids interested. What really impressed me was that it was informative, but not too scientific or too cutesy, as is often the case in the age group. A good selection of illustrations and photographs to keep them focused on the learning. The kids will enjoy the chapter that deals with 2 young boys that found a fossil, they will feel a connection and maybe even encourage them to look further into the subject. The fact file at the back of the book is a very useful tool. I think this would also be a good series for older kids with reading difficulties.